Leadership Discussion Series: Find the Financial Guru In You! The NALS Leadership Identification Committee (“LIC”) is tasked with identifying potential future leaders for service on the NALS Board of Directors and assisting leaders in finding other leadership roles within the Association as committee and task force chairs and/or members. Pursuant to the LIC Operational Plan for 2018 – 2019, potential NALS Board of Directors candidates will be assessed on the talents, abilities, and vision they demonstrate. NALS and the LIC values and seeks diverse leadership as defined by race, ethnicity, gender, religion, age, sexual orientation, nationality, disability, appearance, geographic location, area of law, professional level, etc. The LIC has identified a number of desired attributes that will be a part of the selection process for new board members. We will be presenting a series of articles and hosting Zoom calls to discuss each of the competency areas we have identified as essential for the success of the organization. In this article, we will discuss NALS’ need for a future board member who is a financial guru and has the demonstrated ability to generate revenue for NALS. NALS cannot continue to exist and thrive in the current market solely from the dues paid by members, the profit from the products and services we currently provide, and the generous support from the NALS Foundation. While these revenue generators are essential to the stability of the organization, the industry is constantly changing and demands more from our Association—which requires more money. The future of the Association depends on creative individuals who have demonstrated their ability to actively raise funds and think of innovative ways to generate revenue to step up and lead the Association. Future board members who possess the financial guru skills will be able to leverage community partner, sponsor, and vendor relationships for the financial benefit of the Association. They will have their finger on the pulse of the value proposition for the membership—what do the members receive in return for their financial commitments and is the price point the right one? A financial guru will be able to discuss whether or not there are additional member benefits that can be added to increase the value proposition. In addition, financial gurus will be able to identify and capitalize on the strengths of the Association to put those strengths to work for the organization's bottom line, including how to tap the staff and volunteer resources within the organization to increase revenue. How do we raise capital from multiple revenue stream sources? If you have an identified goal to serve on the NALS Board of Directors, learning how to become a financial guru and highlighting your success at fundraising and revenue generation would be beneficial to your success as a candidate. If you do not have expertise in this area, there are opportunities for you to develop this attribute. You may consider joining a networking group outside of NALS focused on nonprofit fundraising and business building. Research funding strategies by reading articles, books, and other financially focused material, and put those principles to action in your local and state chapters. Once you have been successful at raising capital, be able to describe the steps taken to achieve financial success and how you can duplicate that success nationally. Whether you are already a financial guru or you are honing your revenue generating skills, the NALS Leadership Identification Committee is here to support you in your climb to the top. If you have an interest in being a part of a community and making a contribution to NALS on the national level, we can help you find the best place for you to put your talents and strengths to work. Please contact the LIC by sending an email to LIC@nals.org. We look forward to hearing from you! Our Financial Guru Zoom call will take place on Wednesday, January 31, 2018, at 8:00 p.m. Eastern/5:00 p.m. Pacific via Zoom meeting. Simply click here or type https://zoom.us/j/5553235829 into your browser on PC, laptop, tablet, or phone and follow the prompts to get logged into the meeting. On each call you will hear from an LIC member who cares about and is invested in the future of the organization and you will be able to ask questions about where you can help. The meetings will be brief—under 30 minutes for those who will need to join over a lunch hour—and informative. If you believe you are a leader, want to become one, or have been told you have what it takes, we hope you will join us. If you have questions, please contact us (Brandi Hobbs, ALP; Kerie Trindle Byrne, PP, PLS, CP; Sherry Baran; Cathy Zackery, CLP; and Charnice Rollie) at LIC@nals.org. 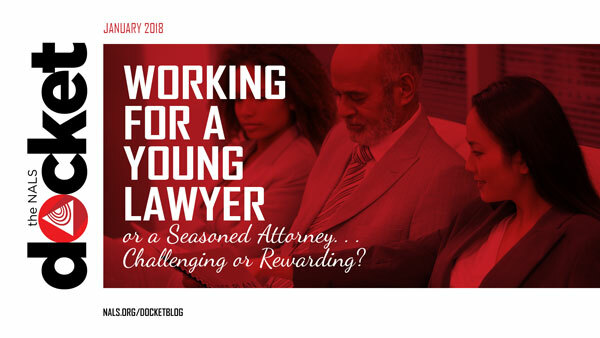 Working for a Young Lawyer or a Seasoned Attorney. . . Challenging or Rewarding? From my perspective, the answer to this question depends on how you view your own career. Seasoned attorneys are typically older, possibly having started their law career without computers or with minimal technology, did most of their research at the law library, and worked for a firm with other attorneys while they were mentored and learned their chosen area of law inside and out. They attended seminars in person for their continuing legal education. The internet was either not around or just beginning for these attorneys. Networking was done the old-fashioned way--a personal phone call or a handwritten note. Building up a clientele took time and patience, and referrals were an important part of their practice. They took pride in their work and built their reputation. Success came after they put in the hard work. It seems like today’s young lawyers who are fresh out of law school have computers and cell phones attached to their hip at all times. As close to paperless as possible is their preference. Continuing legal education can be done via a webinar that they watch during their down time in the evening or weekends. Networking is done via a text or an email. Because many young lawyers do their own typing, and therefore feel they do not need any legal support staff, they set up an office as a sole proprietor and do everything themselves including the legal support staff roles and managing the day-to-day business. They want instant success and some try to practice in many different areas of law rather than learn a chosen area of the law inside and out. Working for the seasoned attorney can cause frustration when they just can’t get rid of that paper calendar even though you keep their calendar current on the computer. They attempt to send an email or do their own edits to a letter, but you end up cleaning up the document or even coaching them along until they hit send. Paperless offices do not exist, but they are trying by at least scanning documents even though they keep the hard copy too. You may even begin to wonder what you will do for a job when they retire. You can turn the challenges into rewards and help secure your career in the future. I personally have found that the seasoned attorneys want to leave their legacy behind. They are willing to mentor young lawyers, but also mentor support staff–even if you do not work for them. I have experienced this first hand when attorneys in other firms have gone above and beyond to help me in my career. If you show an interest in their chosen area of law and make a dedicated effort to improve your skills, these attorneys will mentor you too. They will not only take the time to help you understand what needs to be done, but will help you understand why something needs to be done a certain way. The more you learn and truly understand, the better you will be and the further you will go with your career goals. Anyone can fill in a form or transcribe dictation, but understanding why you need to do what you are doing, and the consequences if it is not done correctly, makes for a great legal assistant. You can also have a rewarding experience working for or with a young lawyer. Chances are you have been a legal assistant for a longer period of time than the young lawyer has been an attorney. You may know what forms need to be completed or what documents need to be sent to the court even if your attorney does not. You can mentor a young lawyer in many ways and help them be a better attorney. You can help them build their reputation by making sure the work you do is to the best of your abilities. Remember, what you do and how you do it is a reflection on them. They are learning just like you had to learn and they may not thank you now, but they will remember you when they are a seasoned attorney. And you never know, you may still be working for or with that same young lawyer when he or she becomes a seasoned attorney. Paula Steffey, PP, CLP-SC, CWCP has been a member of NALS since 2014. She is currently the chair for the Certification Committee and the Attorney Directory project on the Ways and Means Committee for NALS of Greater Kalamazoo in Michigan. She is also very active at the state level and is currently serving as the Vice President of Membership and Marketing, and the Marketing Committee chair. At the national level she is on the Editorial + Marketing Board and S.A.G.E.S. Task Force. To learn even more about NALS she has a secondary membership with NALS of Phoenix and NALS of Philadelphia. Outside of NALS she is a full-time legal assistant to attorney Garold A. Goidosik with Goidosik Morse Disability Law Group and has two other part-time jobs. One of those part-time jobs is her own crafting company where she sells her hand-crocheted items. Besides work and NALS, she is married with two children of her own, a stepdaughter, and a very spoiled golden retriever who is a retired show dog. Remember how your fourth grade teacher taught you to use "a" before a consonant and "an" before a vowel? 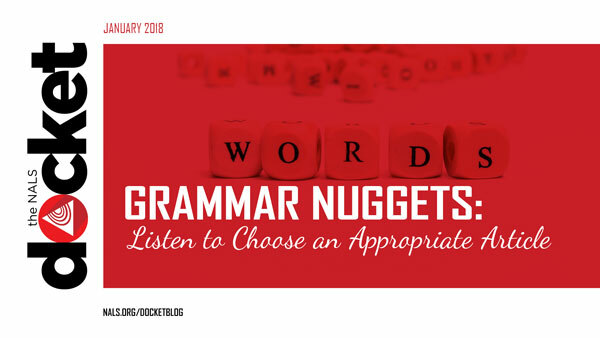 Times have changed and that method—by itself—is no longer a valid way to decide whether to use "a" or "an." Today’s grammar rules indicate that use of "a" or "an" depends on the sound of the next letter, not just whether it is a consonant or a vowel. For instance, the word "hour" starts with a consonant but sounds like it begins with the vowel “o” sound, so it would be "an hour." There are a couple of letters that can be tricky. First, where there is a long u sound (as in “union”) and o with the sound of w (as in "one"), you use "a". Just think of the long u sound as “yoo” (starting with a consonant sound) and the w sound in “one” as a “w” (consonant sound). Just remember it is the sound of the letter that tells you which to use. The same rule will apply when you are dealing with abbreviations and acronyms. It will depend on whether you pronounce it letter by letter or as a word. For example, "a PPO insurance plan." The acronym "PPO" is pronounced letter by letter and the first letter—P—is pronounced as a consonant. Another example would be "an "M.B.A." degree." The abbreviation M.B.A. starts with “M” which sounds like "em", so use "an." I’m a legal secretary in a large and very busy law firm in Manhattan and even though I am the “go to gal” for all kinds of tasks, I’m starting to feel more like an invisible robot than a person. I have great skills in answering the phone, managing people in lobby, completing on time what my bosses ask me to do, I type really fast at 120 wpm, and make a great cup of coffee. I’m happy to be in my job and serve people, but sometimes feel ignored or used or really like the low man on the totem pole. Everything is so fast and everyone is so busy, and I’m proud to be a legal secretary and fill in on the phones and glad to learn new things. I just feel like nobody sees me and the good work that I try to do. Please understand that your role in the office is very important. Every person in the office has different skills. It is not really that they don’t see you, it is that most people are focused on their cases or their clients or on what they have to do in a day. Being a legal secretary is a great job and a great career. You may be more personable than most people and that is why you are able to work with the general public and your boss. Not everyone can do that. What I’m saying is to be proud of what you do anyway. Enjoy your job and the people you work with and serve. The other part of this situation is knowing what it is you really want. Do you want to be more than a secretary? Moving up in a career may create less work-life balance, so you really have to know yourself. Remember with a high-stress position there is less personal time. There are ways you can grow in your skills and confidence and know how far you want to go with a legal career. Take it one step at a time. First, stay involved in your local and state chapters of NALS and set a goal of attending an Annual NALS National Conference. Visit the NALS website and look in the Library for publications, webinars, and online classes. Watch for a NALS Basic Legal Training Course to attend in your area toward being certified. If there is not one, you could access NALS Online Study Hall, including study materials, in various formats. Visit with your office human resources person to see if the firm is able to pay for some of your legal education and certification. There are three levels of certification with a natural progression of education about the law: ALP/ALS, PLS/CLP, and PP, with a Specialty Certificate in many areas of law. ALP/ALS is the Accredited Legal Professional/Accredited Legal Secretary; PLS/CLP is the Professional Legal Secretary/Certified Legal Professional; and PP means the certified Professional Paralegal. Specialty Certificates are for PLS/CLPs and PPs whose careers are focused in various areas of law, such as real estate, family law, criminal law, etc. It is a good idea to investigate what is required of each so you will know exactly what your plan will be. The best part of a legal career is that you can learn more and more about the law. Some Professional Paralegals have gone on to become attorneys. Being a legal secretary takes a special person with special skills and you are about to take the best journey of your life in discovering each step of growing your own career in law. 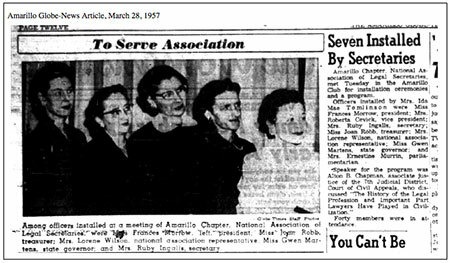 NALS of Amarillo, the first NALS Chapter in the state of Texas, is 60 years strong, with 33 members active within their chapter and out in their community. That is the secret of their success. The 2015-2016 Board of Directors had a goal to streamline information for chapter news and created a centralized email, a new website, and a Facebook page that now has 50 friends. All of this is due to the hard work of Beth Langwell, Rhonda Rogers, Cynthia Huffman, and Becky Braden. This very neat and elegant website has information for members and those who are interested in becoming members too. There are tabs to visit 2017 Officers, which include their biographies; About NALS, which includes the Code of Ethics; Bylaws, Calendar, Community, Lunch n’Learns, Redbook Legal Directory, Job Bank, Chapter Ts (t-shirts); and From The Director, a welcome page for members including details of big NALS of Amarillo events as well as National NALS Conferences. The Membership tab explains the tri-level association, has detailed useful information for new members, and has links to the state chapter, TexasALP.org. Current NALS of Amarillo President Elka Murphy says, “As Texans, NALS of Amarillo strives to include all legal support staff within our membership and always welcomes the opportunity to mentor those starting a career in the legal field.” This is demonstrated by the chapter’s partnering with Amarillo College’s two-year Legal Studies Associate Degree Program and the fact that the professionals in the chapter boast academic degrees and well-earned high percentage of NALS Professional Paralegal (PP) certifications. NALS of Amarillo serves the community by participating in fundraisers to help non-profit organizations such as the Evelyn Rivers Christmas Project to give coats, hats, and gloves to homeless children; and Snack Pack 4 Kids to end weekend hunger for those in the Texas panhandle. One of their proudest community service efforts is assisting the Faith City Mission Drive to feed at least 100 people each time. The chapter also participates in fun community events like The Color Run, also known as “the happiest 5K on the planet,” One Year benefitting the Laura Bush Women’s Research Foundation; and the Downtown Amarillo Block Party, on sabbatical, replaced by the Center City Amarillo Festival. 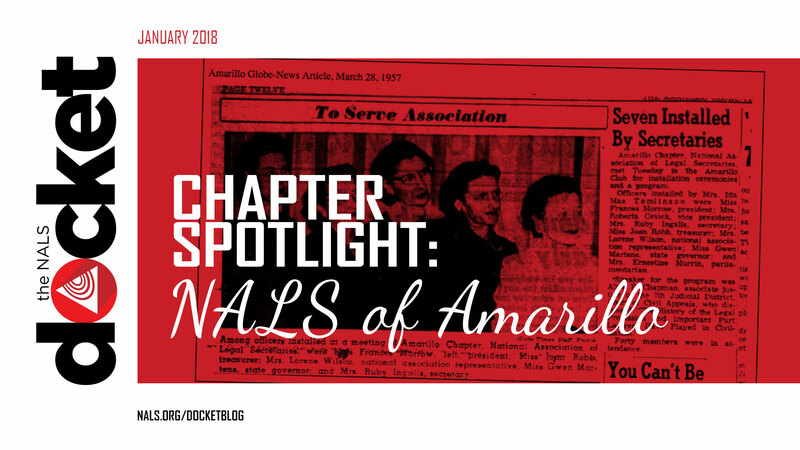 The NALS of Amarillo chapter can teach us all how to grow as legal professionals and as individuals, through networking in and outside of our chapters, and through community service to others. Here is to the next 60 years for NALS of Amarillo!